In exchange for a small equity stake in their companies, the Sunnyvale, CA-based Plug and Play Tech Center provides $25,000 in financing for companies that enroll in the accelerator. 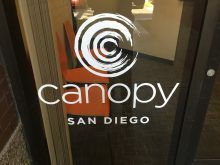 Companies begin the five-month program in San Diego and move to the Plug and Play Tech Center in Sunnyvale for the final 10 weeks, and features a combination of workshops, speakers, mentorship sessions, and coaching. Companies that complete the Startup Camp also get an opportunity to make a presentation to venture investors at a “Demo Day” event in Silicon Valley. Ahorro Libre: Based in Tijuana, Ahorro Libre (Free Savings) provides a Web-based technology platform for arranging micro loans and other financial services in emerging economies. The startup’s first objective is to help shift users from Rotating Credit Associations (groups of individuals who agree to meet for a defined period to save and borrow together) to a simple and transparent platform that can be easily used by anyone with basic Internet knowledge and access to SMS messaging. Brandisty: A cloud-based storage service, San Diego-based Brandisty provides image resizing, typography, color pallet generation, and color space conversions for digital and print without customers needing to know how to use Photoshop or Illustrator—making it easy for users to store, modify, and distribute their brand. Hotelbeat: A Web-based platform, San Diego-based Hotelbeat provides business intelligence analytics for the hospitality industry, focusing on the underserved hotels ranked with one-star to three-star ratings. Locbit: A Web platform intended to make the Internet of Things (IoT) easily accessible. San Diego’s Locbit connects devices to networks everywhere, by unifying IoT on one software platform that is accessible by any Internet-connected device. For example, at the 2014 PGA Open tournament at San Diego’s Torrey Pines Golf Course, Locbit technology enabled fans to access the massive NeoVision screens throughout the course. By scanning a QR code, tournament fans could access player bios and other tournament information, and automatically receive the latest scores on their mobile phones. Statim Health: A Denver-based startup, Statim Health enables users to make GPS-based side-by-side comparisons of prescribed medical procedures, diagnostic services, and other healthcare options to the most qualified and affordable care.